Gas Chromatography - Inductively Coupled Plasma - Mass Spectrometry analysis combines three analytical tools: Gas Chromatography, Inductively Coupled Plasma and Mass Spectrometry, into one integrated system. It allows lower limits of detection for metals, sulphur and mercury speciation in crude oils and oil products. GC/ICP/MS provides a powerful laboratory technique for analyses, with the capability to separate and quantitate ultra-trace levels of metals and organo-metallic compounds. This powerful analytical tool is available from the Intertek laboratory network in the UK. Samples can be easily shipped for testing. 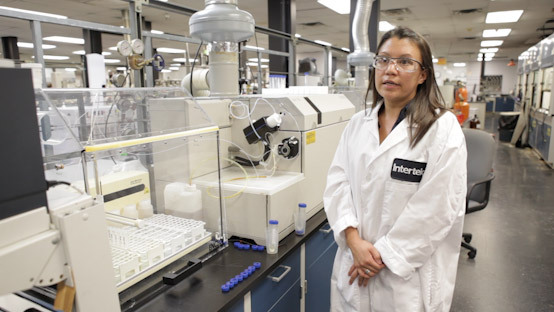 In conjunction with Liquid Chromatography - Inductively Coupled Plasma - Mass Spectrometry (LC/ICP/MS) both techniques facilitate enhanced water analysis allowing comprehensive information to be obtained. The GC-ICP-MS system is equipped with a high sample throughput auto sampler. 100 samples can be processed using 100 different methods. The unique software controls both the GC and the ICP-MS, preventing miscommunication between both instruments.